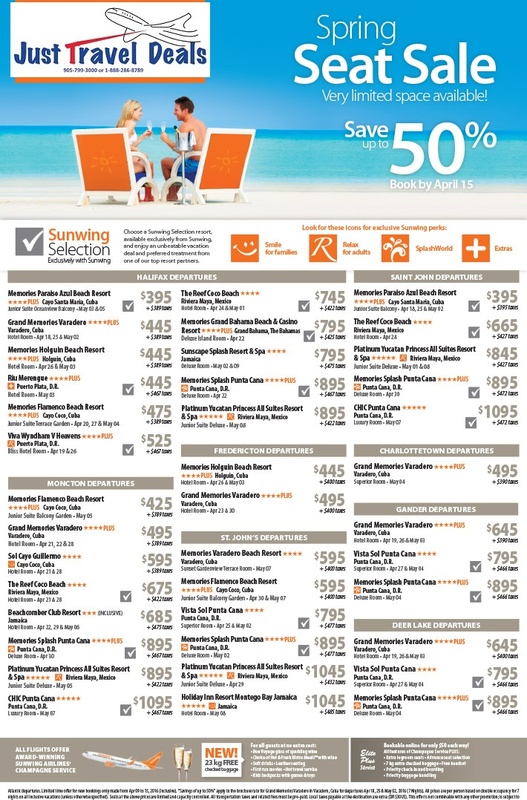 South Free Room Upgrade Royal Playa del Carmen, Hyatt Ziva Cancun, Gran Caribe Resort book by March 7 South It’s Win! Win! with Paradisus Paradisus Roulette in Riviera Maya A surprise vacation at 1 of 2 resorts YHZ, YYT, YQM, YFC departures from $2079 Florida Kids Stay Free! Adult packages from $619 All-In Orlando Air Only from $549 YHZ, YYT, YQM departures Cruise Promotions Sail Away Event $300 Instant Savings Exclusive Europe Free Beverage Package with MSC, Kids & Teens Sail Free with Costa plus, more great offers! AIR TRANSAT voted best North American Leisure Airline four years running by Skytrax!